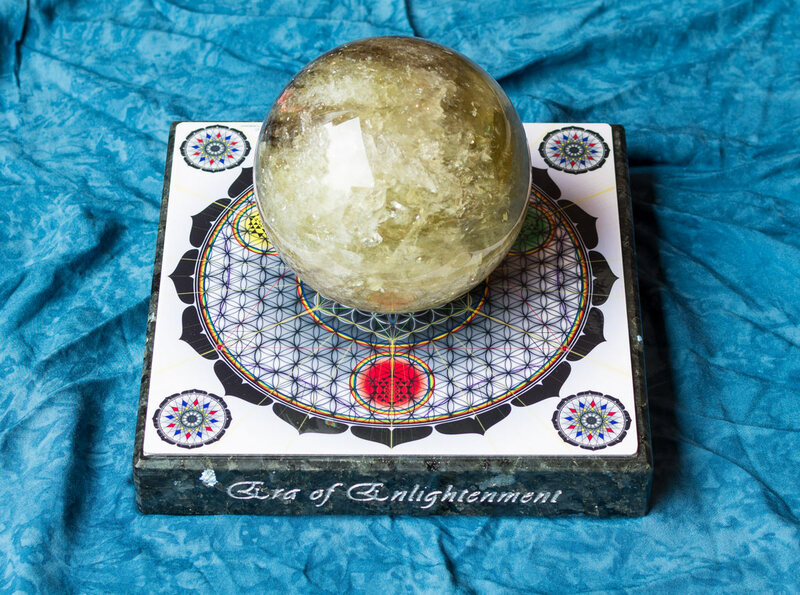 EoE spheres are powerful tools to spread the EoE energies. It can a whole house in the EoE energy. As with all the EoE crystals, the EoE energy calms the mind, opens the heart and activates life within. The Jade sphere. Apatite and Nephrite are the best EoE materials in the world. While EoE apatite is more outward in its energies, Nephrite is more inward and centered in the heart. It actually creates a black hole inside the heart, pulling and dissolving all negativities and energetic blockages inside and crunch it into pure kundalini energy that in turn moves it up and out of the crown chakra. It does this extremely powerfully and very deep. When speaking of jade, one can be referring to jadeite or nephrite pieces. Although similar, jadeite and nephrite jade have different physical and chemical characteristics. Jade in both of its forms is used in quite a few different applications, from carvings and jewelry to kitchen ware. Jade has been used as the base for carving since the prehistoric times. As jade is such a hard material, it was able to be used for weapons such as knives and tools for edging. Once other materials were discovered for tools, jade became used for more ornamental than utilitarian purposes. In the early Chinese dynasties, jade (or nephrite jade) was used for utilitarian and ceremonial objects including jade burial suits. It was considered the “imperial gem.” The qualities of jade, its colors, and its hardness, caused the Chinese to associate it with the soul and immortality. Many of the native sources of jade in China have been mined out; most of the modern Chinese jade comes from the province of XinJiang. The light blue/green EoE Jade was found in China and is more soft compared to the dark green nephrites from the Himalaya and the mixed nephrites from Madagascar. 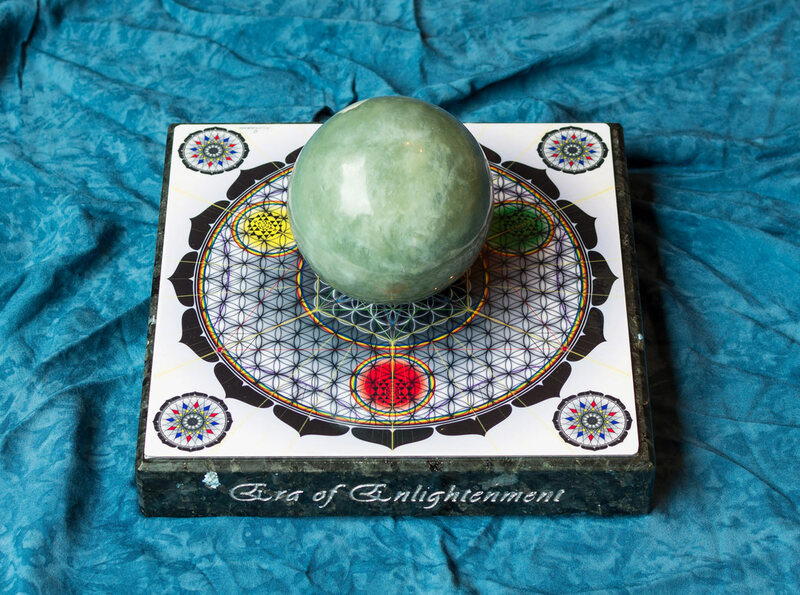 The sphere is placed on a 20 by 20 cm EoE trained labradorite plate (3 cm thick) with the EoE geometry on top of it to make the Nephrite Jade come to life and flower its energies around the system to fill the room with its energies. 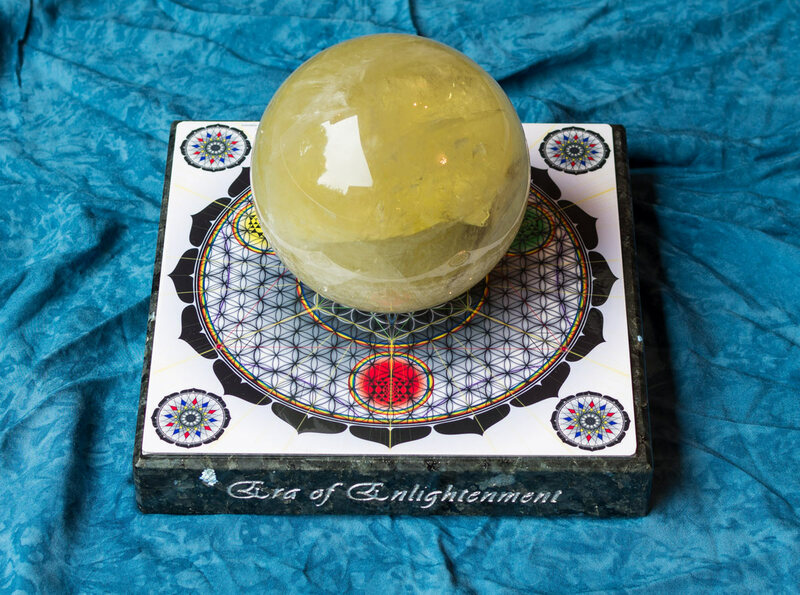 The Citrine sphere brings forth the pure EoE energies with the added focus on energy centered around the navel area. It China this area is called the lower Dan Tien and is like a reservoir of energy. The Amethyst sphere brings forth the pure EoE energies with the added focus on silencing the mind. If you have a busy mind constantly in conversation then amethyst is your choice of EoE sphere. You have to get used to a more quite mind as in the beginning it may look like dementia or forgetfulness but you will realize that it is not the ability to remember that is important but the ability to know. The EoE amethyst sphere is also not regular amethyst but is a special type called Chevron Amethyst, which works just a bit better then regular amethyst. 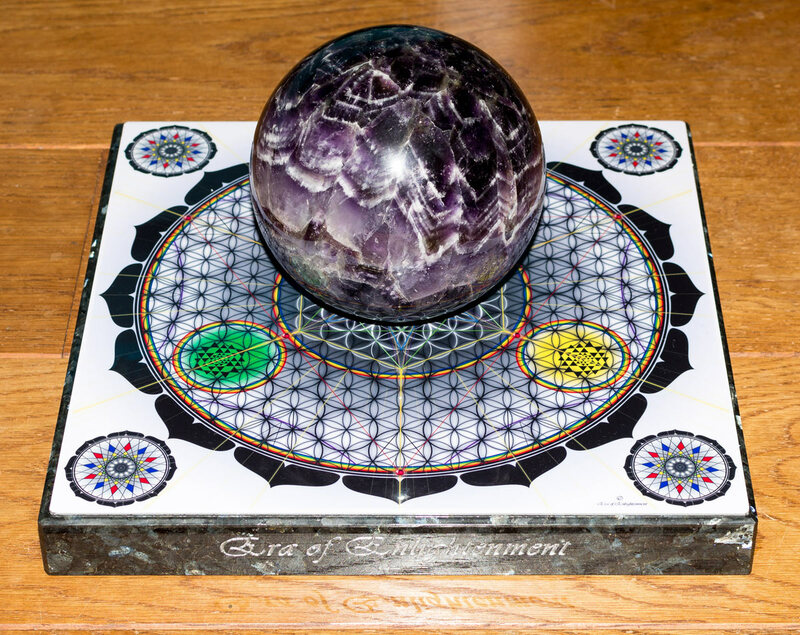 The sphere is placed on a 30 by 30 cm EoE trained labradorite plate (3 cm thick) with the EoE geometry on top of it to make the amethyst come to life and flower its energies around the system to fill the room with its energies. 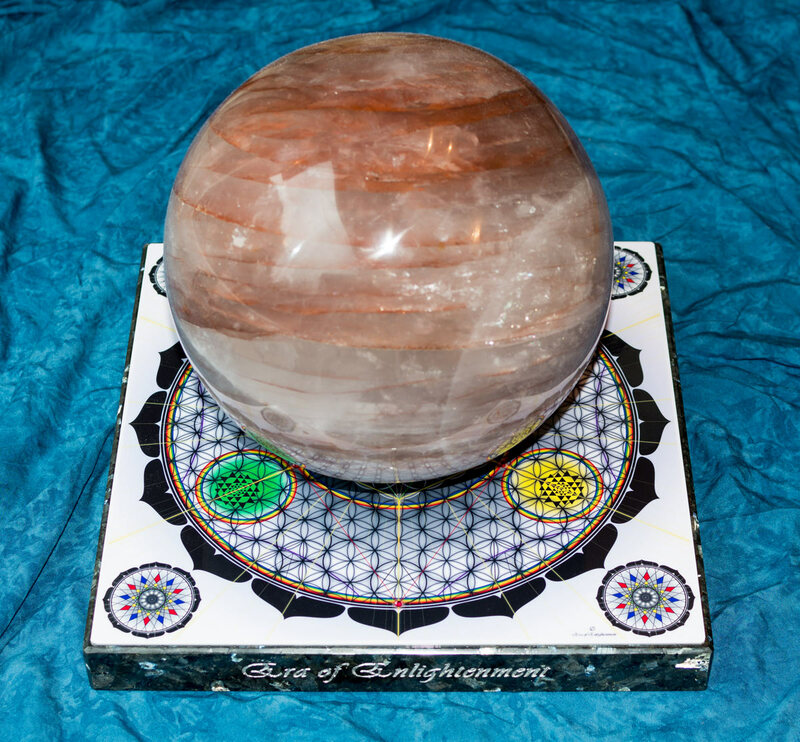 The Rhodonite sphere. This beautiful Rhodonite sphere was found in Madagascar and is known for its capacity to bring emotional healing and releasing blocked energies from the heart. It is a strong heart crystal and with the EoE energies it magnifies this many fold. As you already know, the EoE energy awakens the kundalini and opens the heart and silences the mind. With this Rhodonite the main emphasis is on opening up the heart, while EoE apatite mainly awakens the kundalini from the root chakra and EoE nephrite awakens the kundalini from inside the heart, rhodonite actually flowers the heart with the EoE energies. It is a warm energy that grounds the EoE very well. You just want to stay near it to feel at home anywhere you are. 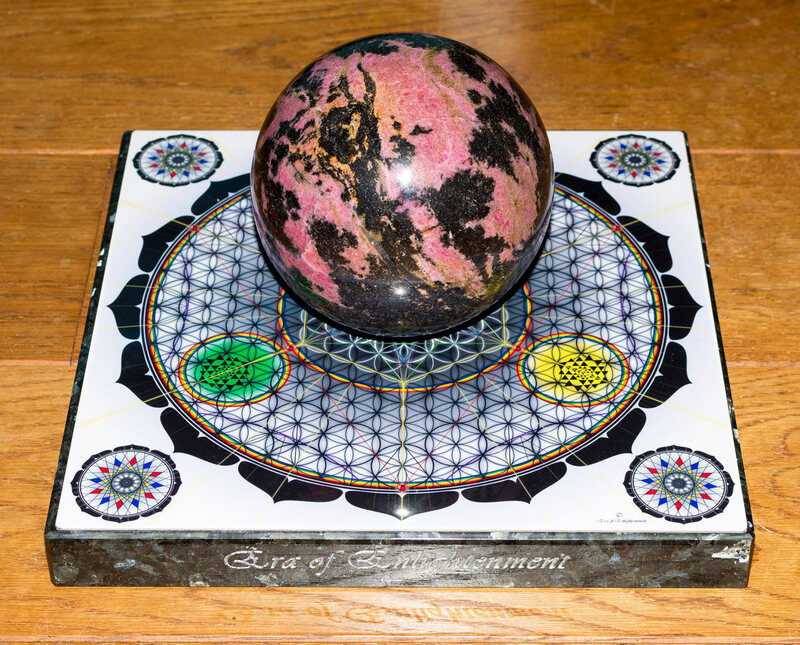 The sphere is placed on a 30 by 30 cm EoE trained labradorite plate (3 cm thick) with the EoE geometry on top of it to make the Rhodonite come to life and flower its energies around the system to fill the room with its energies. The Seraphinite sphere is a type of clinochlore found in the lake Baikal in Siberia that have angel wing like markings on them. It is also known as a crystal that links you to the angel domain and nature spirits to bring forth healing energies for the physical and emotional bodies. 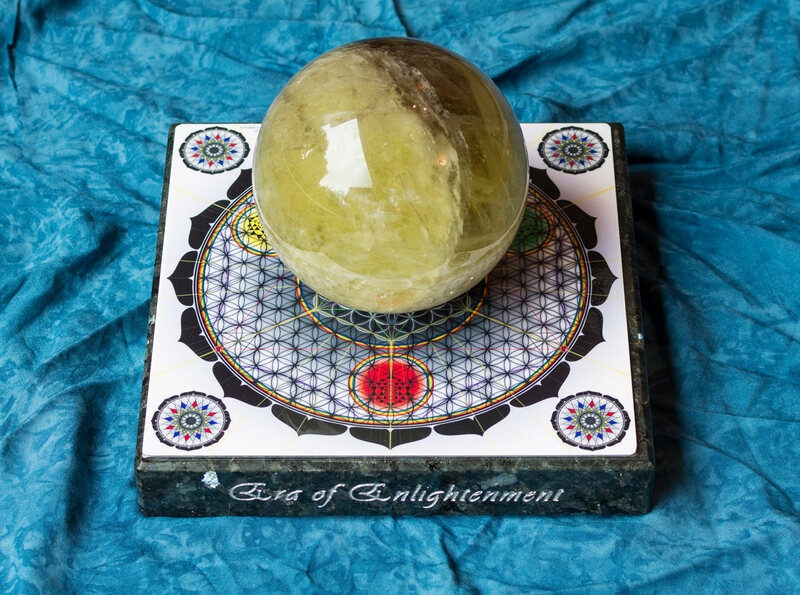 When connecting seraphinite to the EoE kundalini energies we were surprised to see how well they work together and activate the kundalini in the heart and higher chakra regions. It actually merges mother nature with the kundalini energy starting in the heart area. It is not as powerful as EoE Apatite and EoE Nephrite but it is much more caring and connecting (to higher realms), something that apatites and nephrites do not have. 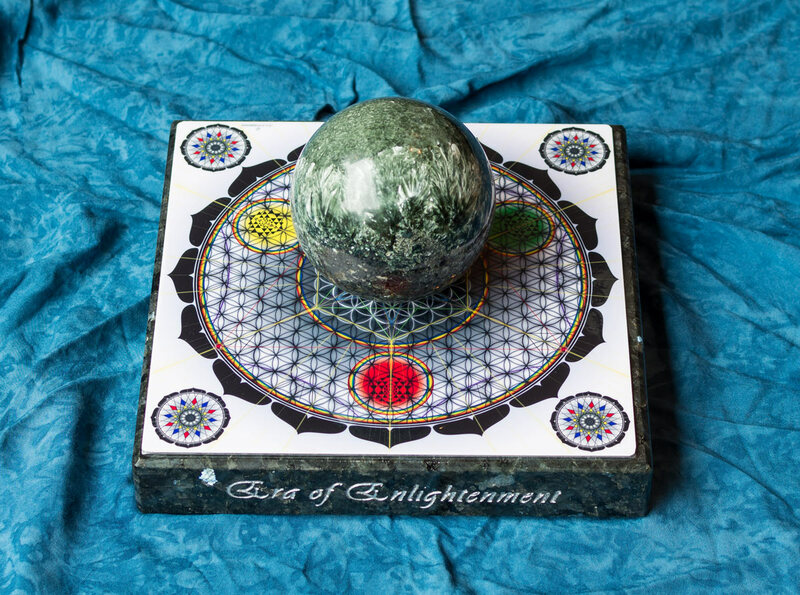 The sphere is placed on a 20 by 20 cm EoE trained labradorite plate (3 cm thick) with the EoE geometry on top of it to make the seraphinite come to life and flower its energies around the system to fill the room with its energies. 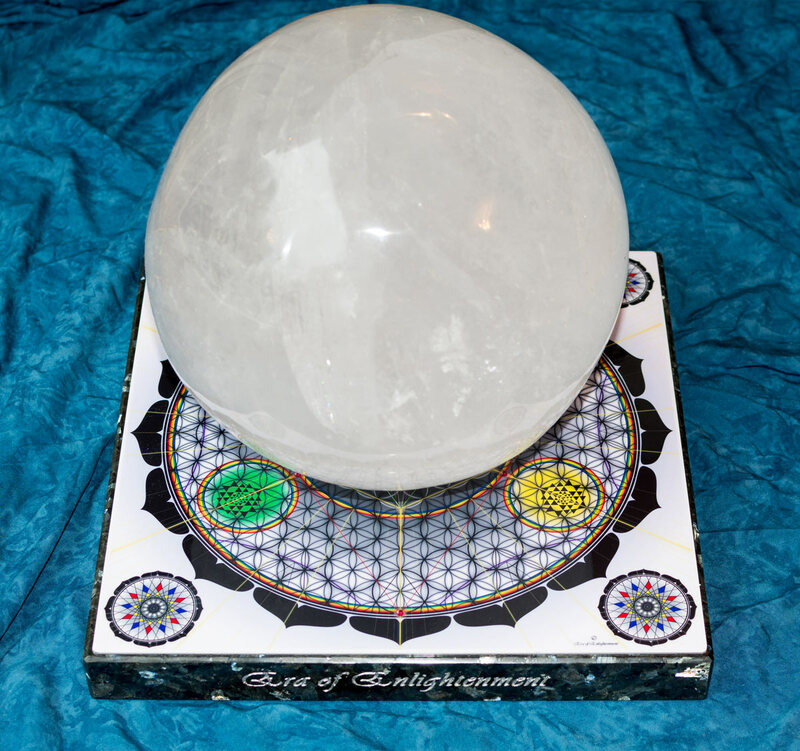 The Quartz sphere is found in Madagascar and is filled with the EoE energies. Quartz is not the most powerful EoE material but due to its large size it really brings forth the pure EoE energies. 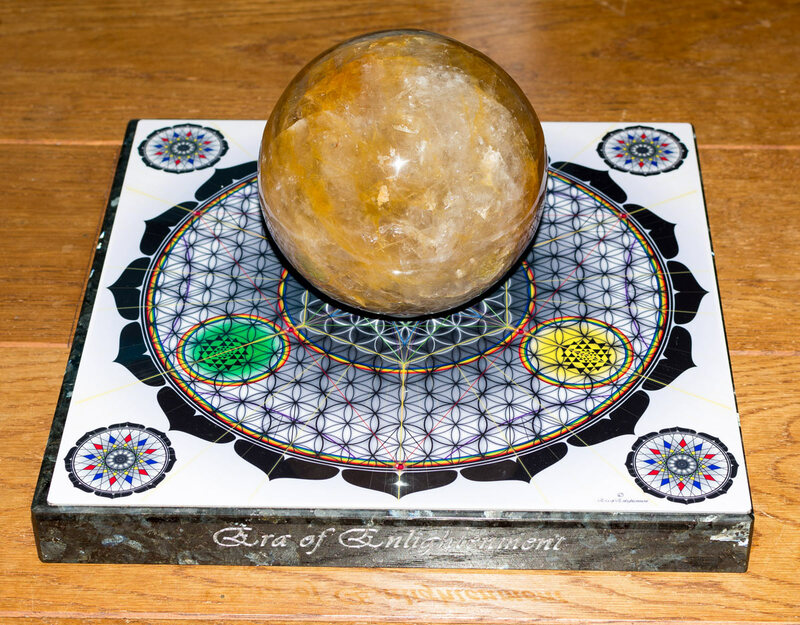 The sphere is placed on a 30 by 30 cm EoE trained labradorite plate (3 cm thick) with the EoE geometry on top of it to make the Quartz come to life and flower its energies around the system to fill the room with EoE energies. The Hematoid quartz sphere is also known as Fire quartz and is found in Madagascar and are the best EoE quartz for the kundalini energy. It both grounds the kundalini and fires it up. 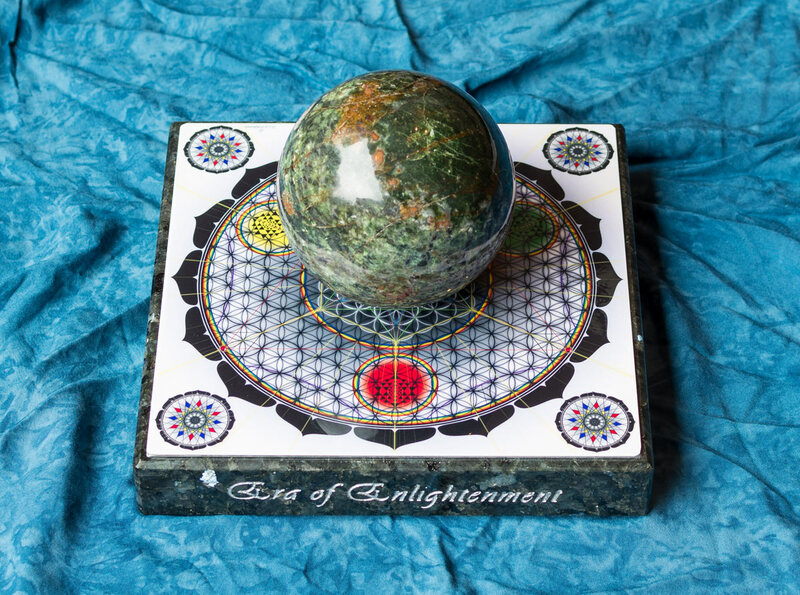 The sphere is placed on a 30 by 30 cm EoE trained labradorite plate (3 cm thick) with the EoE geometry on top of it to make the Fire quartz come to life and flower its energies around the system to fill the room with its energies. If you like to order multiple products, please advice us on email so you can save on the shipping costs.